Glyph is a new mobile application, now live in the iTunes App Store, that will tell you the best credit card to use in order to earn the most valuable rewards, whether that’s cash back, travel or hotel loyalty points, discounts, or any other type of credit card-activated reward. At launch, the company supports over 250 credit cards, including the top 18 credit issuers in the U.S., representing over 90% of today’s credit cards transactions. The app’s primary feature is its real-time alerts, which also use a geolocation to identify the store where you might being making a purchase. 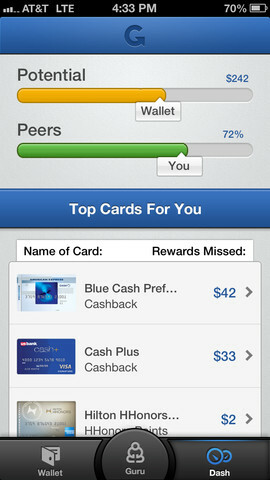 These alerts will allow you to identify which card in your portfolio makes sense, in terms of maximizing rewards. However, the app also offers a way to examine your entire card portfolio, in order to better highlight other trends, and it can make overall suggestions across your portfolio. For example, it could tell you things like, if you’re getting less than a certain percentage on groceries, you should be using a different card. It can also tell you how much money you’ve left on the table, so to speak, by using the wrong card. In the future, Glyph will expand further to also include card account management features, alerting users to things like balances and due dates, among other things. The idea to offer consumers increased visibility into the various reward programs is not unique – another company, Wallaby Financial, is doing the same thing. However, Wallaby’s solution involves a universal card which, when swiped, automates the process of selecting the best card for the consumer, based on how the consumer has configured Wallaby’s service (e.g. “maximize for airline miles”). Most importantly – and this is a key distinction – Glyph does not require that consumers hand over their credit card account information in order to use the service. Instead, all that’s needed is a list of what type of cards are in your wallet. Glyph can make its recommendations on that info alone. Currently Glyph is free to use, but it will monetize in the future through optional, premium features and its card recommendations. 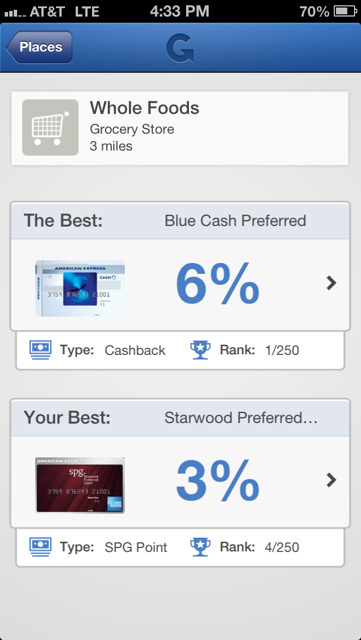 Based on spending trends, it will be able to suggest cards that will help users earn better rewards. Today, Glyph has a deal with Discover, and Vichich says that they’re looking to form more partnerships with other card providers in the future. Based in Detroit, Glyph is now a team of six (half of whom are full-time). The company is backed by $500,000 in seed funding from local angel investors. You can download the app for free, here in iTunes.